"Become a Successful Magician for Fun or Profit!" What child cant recall memories of their first magic show? Maybe he or she have seen some of the pros at work on their television but had never seen a magician at work up close and personal. Its. . .well its magic! Have you ever wondered, how did they do that? Of course you have! Doesnt everyone? Maybe you are one of those people who has always had a secret passion to actually perform some of those magic tricks and dazzle an audience with your own brand of excitement. Well, you CAN do it and Become a Successful Magician for Fun or Profit! can show you how. It doesnt matter if you just want to surprise your friends and family or if you would like to actually create a new avocation, there is plenty of information inside to answer your questions and help you decide how to move on. Many folks who pursue the possibility of becoming an amateur magician become quite surprised when they learn that their favorite hobby is a skill that is in demand. Perhaps you just want to keep it simple and learn a few tricks so you can entertain at your childs next birthday party. The party comes and you are a hit with the kids! Before you know it. . .
A few weeks later you get a call from the parent of one of your childs friends asking if you would do the same for their son or daughters birthday. Not only do they ask if you will do it, but they offer to pay you for your time! Pretty amazing, isnt it? Before you even realize what hit you, it happens again and again. Suddenly the little hobby you learned to entertain your kids has mushroomed into a part-time business. And it works! Maybe your passion isnt to turn your hobby into producing an income but regardless of your reasons, what you learn in Become a Successful Magician for Fun or Profit! will serve you very well. Should you buy or make your own props? How to "set the stage"
Youll get a full helping of everything you need to know to Become a Successful Magician for Fun or Profit! Anyone can do it! Through the years, young and old alike have marveled at the illusions created by magicians. If you have been captivated and have a sincere desire to become an accomplished amateur or professional magician, you owe it to yourself to at least check it out. You can easily do that right now by reading Become a Successful Magician for Fun or Profit! 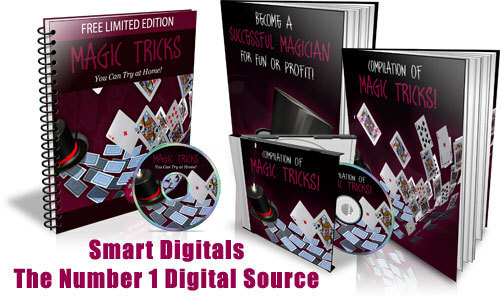 Become a Successful Magician for Fun and Profit (PLR Rights) magic;profits 148157839 31.00 daytoshopmaster Fresh Download Available!